Appleton™ Mercmaster LED Low Profile with Emergency Battery Backup luminaires by Emerson offer reliable and rugged emergency lighting for 90 or 180 minutes providing peace of mind that in the event of a sudden loss of power, workers have a well-lit path to safety. With three lumen output options ranging from a 3000 - 5500 lumens (70W - 175W HID equivalent), three Correlated Color Temperatures (CCT) - Cool (5000K), Neutral (4000K) and Warm (3000K), seven mounting hood options, and three field changeable globes (Clear and Diffused Polycarbonate, and Clear Glass), this compact, lightweight and highly versatile task light is ideal for Hazardous or Harsh industrial applications with mounting heights of 15 feet or less. The Mercmaster LED Low Profile with Emergency Battery Backup offers automated functional testing every 2 weeks and an annual duration test of the battery with easy to see from the ground LED indicator lights indicating charging and fault status. The simple quick disconnect feature that disconnects power between the LEDs and the Battery Management Module also allows for safe maintenance if and when maintenance is necessary. With recent advancements in efficiency and more rugged engineering of LED luminaries, the harsh industrial and hazardous location industries are poised for widespread adoption of this exciting technology. Emerson is leading the way with its Appleton™ Areamaster™ LED Generation 2 floodlights. To address the global demands of industry, Emerson has added additional features and functionality to its Award-winning Appleton™ Mercmaster™ LED Low Profile Series Luminaires. 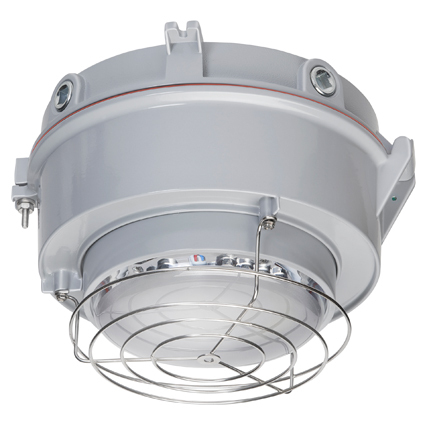 Rugged and corrosion-resistant, this luminaire is certified for Class I, Division 2, Class II, and Class III hazardous locations and for ATEX/IECEx Zones 2, 21 and 22.